Great news everybody! 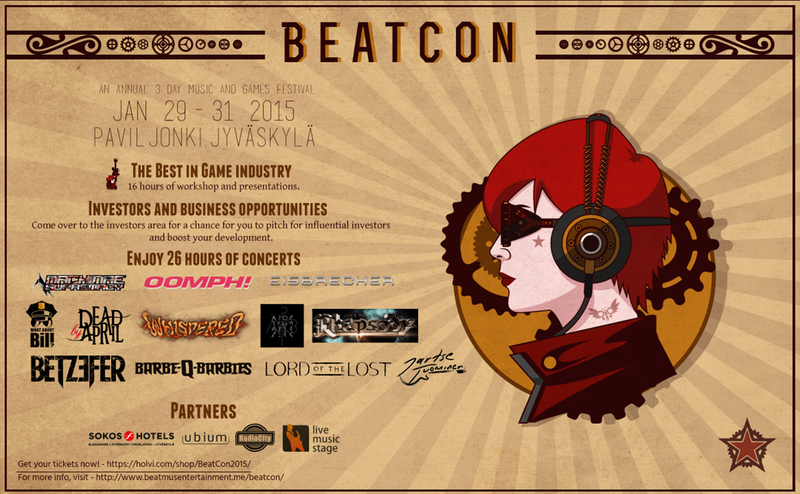 Unzyme will be a part of the outstanding lineup of BeatCon music & games festival 2015. We will perform on the same day with Apoptygma Berzerk, which is one of our biggest inspirations and long-time favorites. A good bunch of legendary bands will be there, including Oomph!, Eisbrecher, Blutengel, Lord of the Lost, What about Bill?, Luca Turilli’s Rhapsody, Machinae Supremacy, Dead by April, In Strict Confidence, To/Die/For, Bloodparade, Barbe-Q-Barbies, Jartse Tuominen, Cønstantine, O.S.P., Fireal, Betzefer, Whispered, The Silenced …and more! Gaming companies and their masterminds are also well presented at BeatCon. Prepare for an overload of fun. Unzyme will conduct their experiment on January 29th, but we recommend getting the full festival pass!